The traditional mainstays of Tsarist Russia had been the peasantry and the Church. And the Church in turn gained much from the support of the State. However, it was increasingly accepted that while the Church should be supported by the State, she should not depend on it, financially and administratively, to the degree imposed on her by Peter the Great’s Spiritual Regulation, which had abolished the patriarchate and made the Church almost a department of the State.Indeed, by the turn of the century it had become almost an article of faith among the Church and near-Church intelligentsia that Church-State relations needed a thorough overhaul in order to bring them closer to the “symphonic” ideal inherited from Byzantium. Tsar Nicholas, with his deep love of pre-Petrine Russia, took a close interest in this question. He believed in giving the Church more freedom, and that that freeing the Church from the dead hand of the State would ultimately be to the benefit of both Church and State. But, perhaps under the influence of his former tutor, Pobedonostsev, he acted cautiously. Nevertheless, one of the most important measures of his reign was his removal from the Constitution in 1901 of the phrase describing him as “Supreme Judge” of the Church. And, as we shall see, if political events had not intervened, it is likely that this would have been only the first step in a far-ranging reform of Church-State relations, bringing them back to true “symphony”. The movement for Church reform first manifested itself publicly in 1901, when, somewhat reluctantly, Pobedonostsev allowed the convening of a series of religio-philosophical meetings between the “God-searching” intelligentsia and the clergy in St. Petersburg. These meetings – the idea of D.S. Merezhkovsky, V.V. Rozanov and a Synodal official, V.A. Ternavtsev – were an attempt to respond to a definite turning away of a part of the intelligentsia from sixties-style positivism to some kind of religion. Unfortunately, however, the conversion was, as often as not, not to Orthodoxy but to some vague kind of mysticism or theosophy. For Russia at that time was teeming with false teachers and prophets: revolutionaries such as Lenin and Trotsky, freethinkers and heretics such as the novelist Lev Tolstoy or the philosopher Vladimir Soloviev, theosophists such as Blavatsky and the “silver age” poets, and a huge army of masons, liberals, nihilists, anti-monarchists and ecumenists who were busy undermining the foundations of Church and State. These meetings were permitted, somewhat reluctantly, by Pobedonostsev between the “God-searching” intelligentsia and the clergy in St. Petersburg. They were the idea of D.S. Merezhkovsky, V.V. Rozanov and a Synodal official, V.A. Ternavtsev, and were an attempt to respond to a definite turning away of a part of the intelligentsia from sixties-style positivism to some kind of religion. Unfortunately, however, the conversion was, as often as not, not to Orthodoxy but to some vague kind of mysticism or theosophy. For Russia at that time was teeming with false teachers and prophets: revolutionaries such as Lenin and Trotsky, freethinkers and heretics such as the novelist Lev Tolstoy or the philosopher Vladimir Soloviev, theosophists such as Blavatsky and the “silver age” poets, and a huge army of masons, liberals, nihilists, anti-monarchists and ecumenists who were busy undermining the foundations of Church and State. Even when the intelligenty did convert to Orthodoxy, as when the philosophers Bulgakov, Berdiaev, Frank and Struve converted from Marxism, it was not to a pure, patristic Orthodoxy, as is proved by the “renovationist Orthodoxy” of Bulgakov and Berdiaev after the revolution. Nevertheless, if these “God-seekers” were ever to acquire true Orthodoxy, they needed to encounter the Church in her more learned representatives. Hence the significance of the religio-philosophical meetings, which were chaired by a rising star of the Russian Church, Bishop Sergius (Stragorodsky, the future first patriarch of the Sovietized Moscow Patriarchate. Another liberal-renovationist cause that Bishop Sergius espoused during the religio-philosophical meetings was that of the novelist Leo Tolstoy. As we have seen, Tolstoy was in essence a radical Protestant, who stood for a Christianity reduced to “pure” morality without the Church, dogmas, miracles or sacraments. His teaching became very popular both at home and abroad (especially in England), both among the educated and the peasants. Soon his followers, although not organized into any “Church”, were rivalling other sects such as the Baptists, the Stundists, the Molokans and the Dukhobors in numbers and influence. May 21 / June 3, 2017. Firsov, Russkaia Tserkov’ nakanune peremen (konets 1890-kh – 1918 g.) (The Russian Church on the Eve of the Changes (the end of the 1890s to 1918), Moscow, 2002, p. 47. Madame Blavatsky wrote that “that which the clergy of every dogmatic religion – pre-eminently the Christian – points out as Satan, the enemy of God, is in reality, the highest divine Spirit – (occult Wisdom on Earth) – in its naturally antagonistic character to every worldly, evanescent illusion, dogmatic or ecclesiastical religions included.” (The Secret Doctrine, London, 1888, vol. 2, p. 377; quoted in Maria Carlson, ”No Religion Higher than Truth”, Princeton University Press, 1993, p. 124). Theosophy influenced many Russian intelligentsy, as was recognised by such philosophers as Vladimir Soloviev and Nicholas Berdiaev (L. Perepelkina, Ecumenism: A Path to Perdition, St. Petersburg, 1999, chapter 9). Rodzianko, The Truth about the Russian Church Abroad, Jordanville, 1975, pp. 5-6. Firsov, op. cit., p. 117. Tikhomirov, “Gosudarstvennost’ i religia” (Statehood and religion), Moskovskie Vedomosti (Moscow Gazette),March, 1903, p. 3; in Firsov, op. cit., p. 137. Solonevich, “Etiudy Optimizma” (Studies in Optimism), in Rossia i Revoliutsia (Russia and the Revolution), Moscow, 2007, p. 59. Gubanov, op. cit., p. 701; Wilson, op. cit., p. 460. V.F. Ivanov, Russkaia Intelligentsia i Masonstvo ot Petra I do nashikh dnej (The Russian Intelligentstia from Peter I to our days), Moscow, 1997, p. 379. St. John, in Rosamund Bartlett, Tolstoy. A Russian Life, Boston and New York: Houghton Mifflin Harcourt, 2011, p. 397. Robert Bird, “Metropolitan Philaret and the Secular Culture of His Age”, in Vladimir Tsurikov (ed. 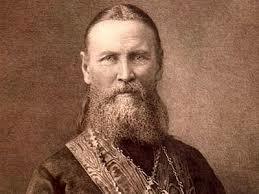 ), Philaret, Metropolitan of Moscow 1782-1867, The Variable Press, USA, 2003, p. 25. Soldatov, op. cit. ; Nadieszda Kizenko, A Prodigal Saint: Father John of Kronstadt and the Russian People, Pennsylvania State University Press, 2000, p. 249. St. Joseph of Petrograd, In the Father’s Bosom: A Monk’s Diary, 3864; in M.S. Sakharov and L.E. Sikorskaia, Sviaschennomuchenik Iosif Mitropolit Petrogradskij (Hieromartyr Joseph, Metropolitan of Petrograd), St. Petersburg, 2006, p. 254. Kizenko, op. cit., p. 88.